Old Rivals go Head-to-Head in New Fan Created Live-Action Series - Downfall! Raiden and Shang Tsung are going at it in the dojo in a new live-action fan project called Mortal Kombat: Downfall! Greg Fountain (Raiden) and Jesse Hectic (Tsung) star in the Fountain directed short - the first of a series. Fountain () is a budding film student of nineteen, producing online content as FountainFilm from his home in Omaha, Nebraska. It looks like Raiden has claimed victory at the time of this posting, but you can still find the alternate outcome by following the link. Had things gone different, it might've been Raiden who suffered a grim fatality, exploded from the inside out by Shang Tsung. Fans can look forward to more Mortal Kombat: Downfall in a series that might be called a spiritual successor to Federation of Martial Arts, with a hefty dose of Ultimate Fan Fights. 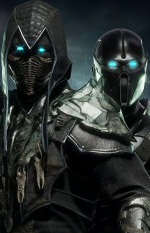 You can suggest future feature kombatants via the YouTube comments. For more Mortal Kombat in motion, check out our komplete kompendium of info and updates for Mortal Kombat: Legacy! Discuss more film in the Media & Merchandise forums, and more fantastic fan creations in the Fan Submission forum! I love fan films. Great stuff. Way better than Season 1 of MK Legacy (excluding the Cyborg episode). <br/> <br/>Dead serious. <br/> <br/> <br/>Wish Shang Tsung had a closer resemblance with the game's costume. <br/>Raiden looks like Raiden. <br/> <br/>9/10 Will spread. <br/> <br/> <br/>Shang Tsung's Fatality was wicked. Way better than Season 1 of MK Legacy (excluding the Cyborg episode). Wish Shang Tsung had a closer resemblance with the game's costume. Shang Tsung's Fatality was wicked. Awesome...kudos on the interactivity too.